Chapter 1: Where is White-Collar Waste Hiding? In Plain Sight! • What do a financial-services company and a tire manufacturer have in common? • Why do 20 percent of earnings go missing—and unnoticed? • Test your knowledge: three “spot the waste” stories. Chapter 2: Did You Notice That Your Most Valuable Assets Have Shifted? • Buried in Babylon: the difference between tangible and intangible assets. • Competencies: mundane work activities that are worth a fortune. • Why your greatest assets remain unrecognized and underproductive. • How unique is your business? Understanding the anti-standardization bias. • Thirty thousand years of productivity improvements—in just five minutes. • Should technology drive work activities—or the other way around? • Why has knowledge work failed to improve when other work has wildly succeeded? • The Industrial Revolution, “big rocks theory,” and the productivity paradox. • Perceptive biases that trick your brain into giving you incorrect information. • Logic biases, flawed rationalizations, and profit-robbing false trade-offs. • The “principle of least effort”: not as simple as it sounds. • The immutable elements of industrial—and knowledge—work. • Three perceptual errors that make the brain ignore these elements. • The “better mousetrap dogma”: market-based suppression of business innovation. • Touring the anthill of knowledge work operations. 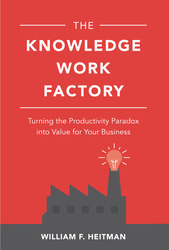 Chapter 6: What's the Capacity of Your Knowledge-Work Factory? • The rise and (mostly) fall of org charts: an unmatched masterpiece from 1855. • How knowledge labor-cost data go missing—and where they’re hiding. • Why knowledge workers believe they’re “exempt” from productivity management. • Five lessons from a century of failed organizational theories. • Taking inventory: the overlooked products your knowledge workers create every day. • How “false complexity” erodes productivity—and impedes standardization. • Lessons from the factory floor: adapting product-based management to knowledge work. • A finance department case study: best intentions, worst outcomes. • Beginning with basics: capacity and work products. • The 1914 productivity death match: Frederick Taylor vs. Henry Ford. • Separating the management of work from the performance of work. • Reducing variance to boost productivity up to 30 percent—without technology. • “The five maybes”: a simple path to business-process improvement. • How to outachieve the overachievers to reach better-than-best- practice performance. • Why today’s knowledge work is tragically under-automated. • Documenting and managing predictable patterns in business processes. • Overcoming the three challenges to activity-level knowledge work improvement. • Which work activities are “unique”? Shattering a longstanding misperception. • Tales of terror: real-world examples of hidden waste (with happy endings). • Doubling and redoubling productivity, one wrench-turn at a time. • The Activity Cube: reconciling four “views” of operations. • Vendor hype versus reality: how much can you actually automate? • Crossing the void: three strategic milestones. • Building your knowledge work factory: a two-phased approach. • Demons of the deep: how to avoid common implementation traps.